Outlandish Observations: The latest news! 1) Here's a very interesting video interview from Access Hollywood with Tobias Menzies, who plays Frank and Black Jack Randall. 2) Here's the latest installment in the "How to Speak OUTLANDER" video series. This week's phrase: "Dinna fash!" 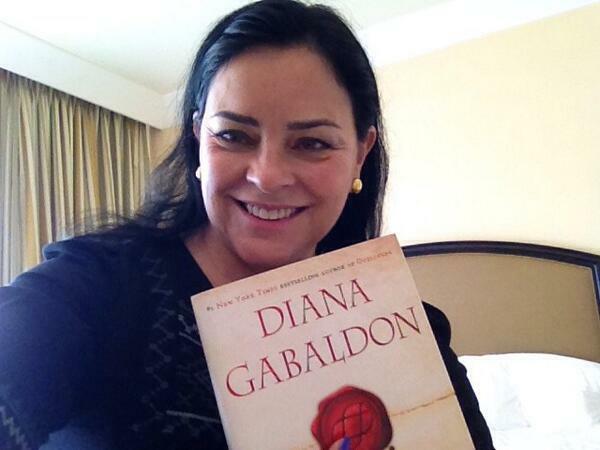 4) Here's Diana Gabaldon with the brand-new, hot-off-the-presses, first-ever copy of WRITTEN IN MY OWN HEART'S BLOOD! She looks so excited to have her "baby" in her hands at long, long last. That must be an amazing feeling! Just a little more than two weeks to go until the rest of us will get to see it, too!! 825 pages, 145 chapters. Nine sections. That's just a bit longer than ECHO, which was 814 pages in the hardcover.